Danish Chef de Cuisine Jeppe Ejvind Nielsen of Gertrud Rask Spisehus at Hotel Hans Egede in Nuuk, Greenland describes his cuisine as "Classic French with a bit of imagination." Growing up in Copenhagen, Denmark, becoming a chef was not one of Jeppe's goals, but rather a coincidence. His said that his mother cannot cook, and that he grew up eating chili and going to eat at the local grill. When he was 18 years old, he hitchhiked through Europe and met a girl in London. Needing money to stay there, he took a job in a restaurant working as a dishwasher. It was there that he learned that food could really be prepared well and with imagination, and from that serendipitous moment, he started paying attention to food preparation and advanced from his dishwasher position to learning how to chop vegetables. He saved his money to purchase a return ticket back to Denmark, and went to culinary school in Copenhagen. I met with Chef Jeppe after having dinner at the gourmet restaurant in August 2007, and when I asked him what he would do if he were not a chef, he deliberated only a moment before replying, "I have no idea. I could not imagine doing anything else." The restaurant features Artic Innovative Gastronomy, and his creativity and hard work won him the Greenlandic Championship in October 2006. He believes in encouraging and inspiring his staff and his apprentice also won an award. Cooking in Greenland does present interesting challenges for a chef though, since all fresh groceries must be imported from Denmark, although local people do collect Greenlandic mushrooms and rhubarb, (the recipe for Poul's Rhubarb is named in honor of the man who supplies his rhubarb.) Menu planning requires ordering vegetables one month ahead, which arrive in containers on ships, and ordering salad greens and herbs one week in advance. 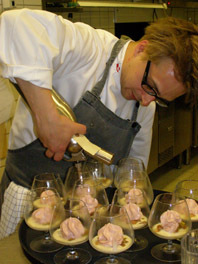 When changing his menu of three starters, three mains, and three desserts, he changes them one course at a time. He visits the local fish market daily where the fish on the menu is dependent on the local catch. Other local products include Greenlandic lamb, musk ox, and reindeer. Working in Greenland for the past two years has also provided him with the opportunity to pursue his other passion - photography. He estimates that he must have shot 10,000 photos of people and nature his first year living in Greenland. 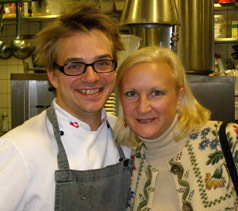 He is hard at work on his first cookbook, Greenland by Sea, by Air, and by Land, due out in November 2007. 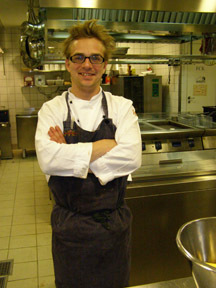 Jeppe Ejvind Nielsen is definitely a chef to watch as his culinary star is just beginning to rise in the sky. Method: Heat the pan over medium heat and add some clarified butter. Put the portioned fish in the pan and hold it down until the skin stops contracting. Sprinkle it with salt and pepper. Fry on low heat until it is done. Method: Julienne the skin of the limes. Add the julienne limes to a pot of heavily salted water and bring to a boil. Drain the limes, let cool, chop, and set aside. Sauté the shallots and garlic in a bit of oil. Add the wine and reduce. Add the rest of the ingredients and the lime juice. Reduce to a sauce and whip in the cold butter. Method: Pick, wash, and blanch the parsley. Dry and blend with the oil and grated Parmesan. Boil the Job's Tear in the stock until done, remove from the heat, and mix in the blended parsley. Method: Peel the garlic and take out the sprouts. Blanch them 3 times, and then boil them in the cream. Puree in a blender. Add salt and pepper. Method: Peel the potatoes and cut them into thin slices. Arrange the slices side by side like scales on a fish approximately 6 x 10 cm. size. Brush them with the clarified butter and bake them between 2 sheets of baking paper at 110° C (225° F) for 30 minutes. Remove from the oven, and roll them over a round mold, and continue baking them at 90° C (200° F) for 3-4 hours or until crisp. Method: Bring the stock to a boil and whisk in the polenta. Add the crème fraîche. Fill the cigars at the last minute, so that they remain crisp. Method: Peel the potatoes and boil them in the milk. Blend until smooth and season with salt, pepper and lemon juice to taste. Pour it into a siphon with gas cartridge. 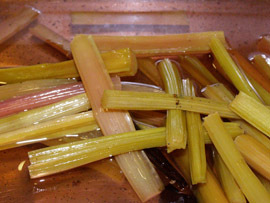 Method: Wash the rhubarb and cut lengthwise into 10 cm. (4 inch) pieces. Sprinkle with the sugar and vanilla refrigerate for 24 hours. Bake them covered for 20 minutes at 140° C (275° F) or until done. Remove from oven and let cool. Method: Boil and puree in a blender, cool down and chill in an ice-cream machine. Method: Boil and puree in a blender, pass through a sieve, heat, and stir in the soaked gelatin. Cool and pour into a siphon bottle with gas cartridge and press twice. Method: Boil the Job's Tear until done. Method: Bring the honey, milk and cream to boil, and then whisk into the egg yolks. Cool and then process in an ice cream machine. 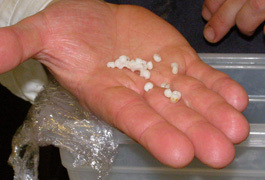 Add the Job's Tear just before serving. Method: Puree the almonds and the sugar in a robot coupe (or food processor) and add enough egg whites to make a consistency of thick dough. Roll into walnut-size balls and bake at 160° C (325° F) until golden. Let cool and break into pieces. Mix all of the ingredients together, roll into hazelnut-size balls, and bake them on baking paper at 160° C (325° F) until golden. Presentation: Layer the Poul`s Rhubarb: Airy Rhubarb Trifle on Honey Soft Ice Cream with Crisp Lakrids in a deep soup bowl. Please other articles on the Gertrud Rask Spisehus and the Hotel Hans Egede in the Hotels and Resorts, and Restaurants sections. Please other articles on Greenland in the Destinations, Hotels and Resorts, Restaurants, Chefs' Recipes (Danish), and Adventures sections.